This is my first review for Idlehands. This is a really good thing. Why? Because I REALLY like discussing myself, things I like, things I don’t like, things I may like… really, the list goes on and on. Honestly, if you’ve spoken to me in the last few decades, there was a 50-50 chance I was waiting on you to stop talking so I can talk more about me. 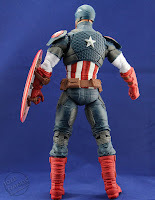 So this idlehands thing is huge, because I love action figures and I really enjoy talking about them. My first review: The brand new Marvel Legends 12 inch 1:6 scale Captain America. Let’s start with the first thing you notice; the box. As boxes go, it’s very shiny and is square. You can imagine my shock when they went for a more traditional box. I thought by now, holographic Tupac would be delivering action figures to me personally. This didn’t happen, so I went ahead and took matters into my own hands and inspected the box. As with most modern day action figure boxes, there is a nice preview panel in front with a few pieces of tape I had to cut to get into the plastic goodness found inside. Pretty standard fare these days, catering to both the collector and the 12 year old who happens to have $50 cash on them. Did I say $50? I paid $39.99 for mine on preorder because I’m special (and by “special” I mean “someone else told me about the deal and I jumped on board”). However, the standard msrp seems to come in at the $50 mark. 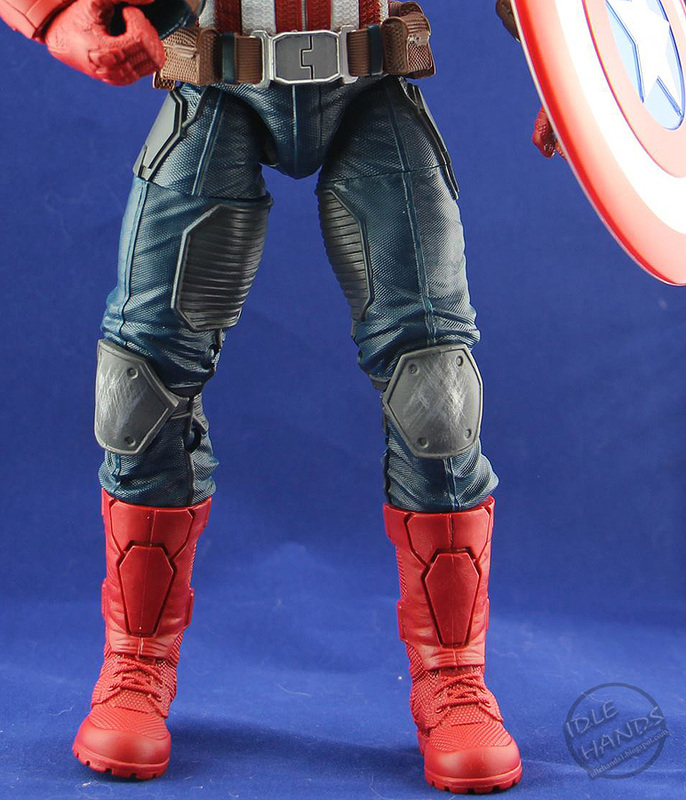 Which, when you consider a 1:6 scale Hot Toy averages around $225, it isn’t too shabby. Now, do you get to stare at a 3D digitally scanned replica of Chris Evans face and slowly undress him while you tell him you forgive him for Rise of the Silver Surfer? No. 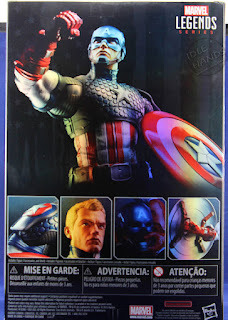 Do you get the best comic representation of Captain America to date? Yes. It’s that good of a figure. The costume seems to borrow bits from the utilitarian uniform from the movies, and, since Marvel/Disney is doing their best to wish the movie fans into comic shops, you'll also see influence from the “Marvel Now” version of Cap. The paint apps are amazing here. Leaps and bounds above their 1:12 counterparts, probably because there is a lot more of, well, everything, to work with for the artists. 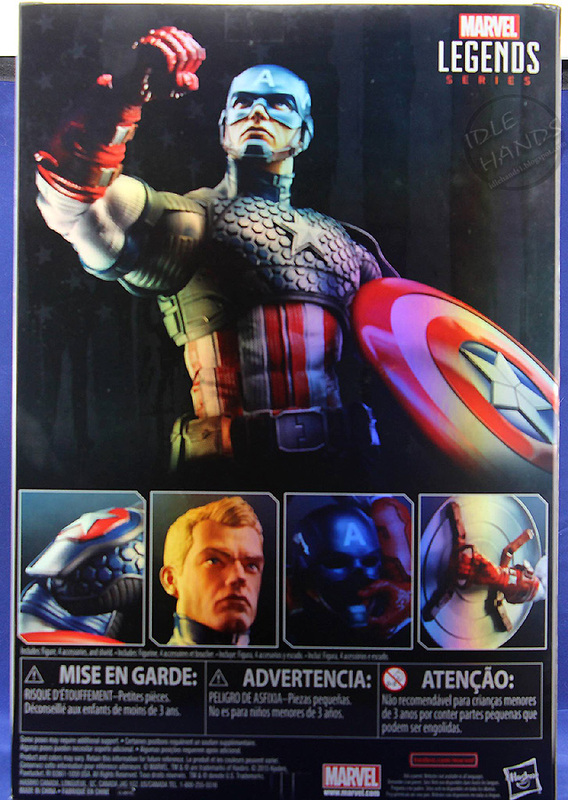 It’s just a really solid mold with ‘Murica all over it. 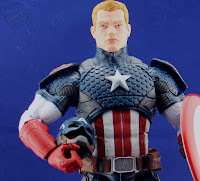 He comes with a set of fists, a set of grasping hands, an unmasked (no helmet) head, a helmet and what may or may not be the definitive Captain America shield. It’s huge in a righteous way. 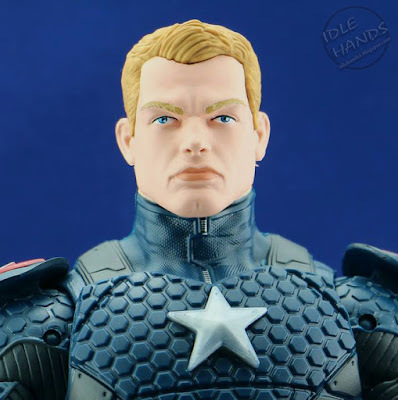 The unmasked head, again, looks like the good Captain from the comics. He has a very serious face. The kind of face that says “I spent a couple years punching Hitler in the face. I hope that doesn’t trigger you.” Now that I think about it, you can pose him in a fashion that looks like he’s taking the helmet off. So I guess you can undress comic Steve Rogers now like you always wanted to. Man, this whole review got really weird, didn’t it? Back on track. 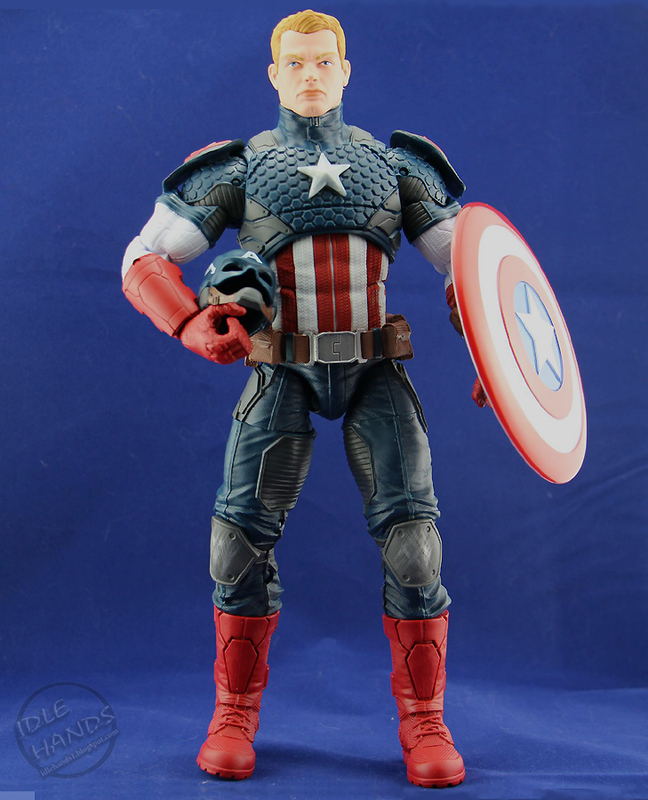 Earlier I mentioned Hot Toys, which I love. 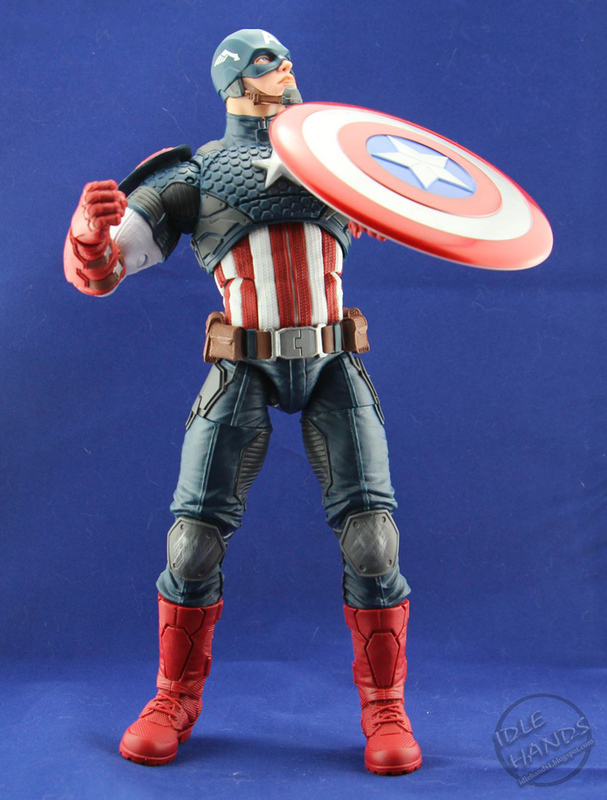 For the most part, you’re limited in posing a Hot Toy to a standard “museum” pose. 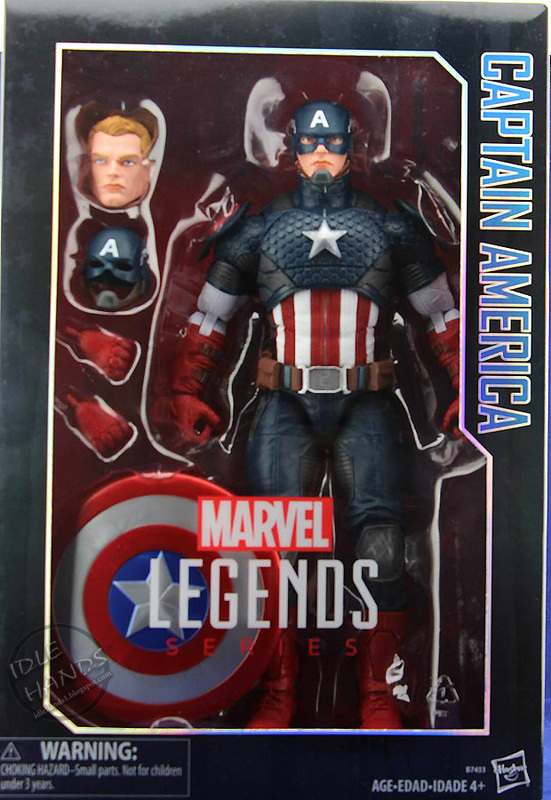 Conversely, this new 1:6 Legend has articulation in all the right places. 30 places, to be exact. Shoulders, biceps, wrists, ab crunches, neck up and down/side to side (beautifully), hips, knees, etc. It’s all there. Want to have him heroically staring down the forces of evil? He can do that. Want to have Cap doing the Macarena at Grandma’s funeral? Now you can. This is not to say he doesn’t have his flaws. His ab crunch is loose right out of the box so I found myself over compensating trying to stand him up. He’s top heavy, but not unlike every other figure ever made, it’s a balancing act trying to pose him. There were some minor paint rubs under the arms but again, nothing major. 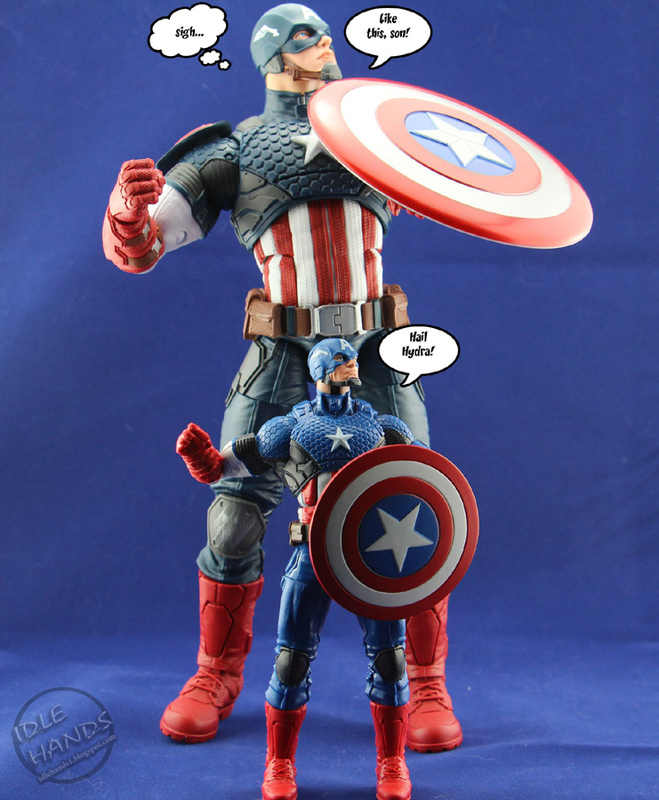 I would have loved to have seen a pointing hand (Cap loves to point, it seems) and a saluting hand or two. Beggars can’t be choosers. Choosers can be beggars though, I think. I can’t remember how that goes. The last thing I would have liked to have seen was a display base or at the very least a stand. 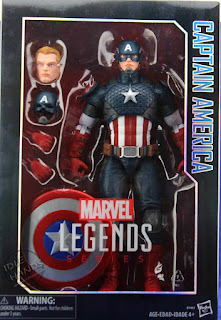 I can get by having Cap grounded, but if there isn’t a stand with Spidey or Iron Man (the only other two in this line) then it’s a wasted opportunity. All of that aside, this is a GREAT looking figure. Fun to look at, fun to hold, fun to make him scare the senior citizens next door by putting it in their bed pan. You don’t HAVE to do that, but I heard the old folks love that. You’ll love having him on display. I see these only going up in price on the secondary market, so I would say get yours now, it’s well worth it. Agree? Disagree? Have a funny limerick? Want to talk about me? Feel free to leave a comment! Until next time, I remain Darian.